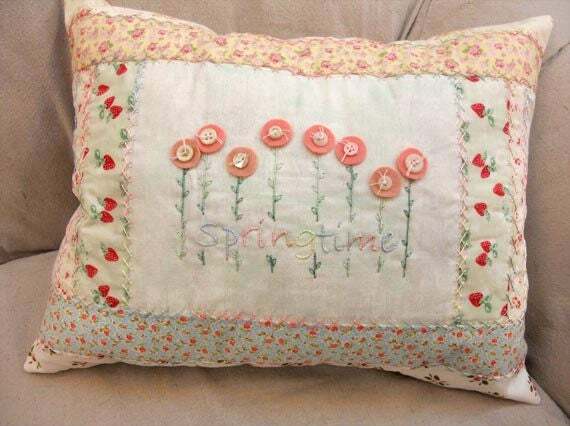 Springtime...the perfect venue for this pillow! A cherry-picked collection of spring prints blends seamlessly with embroidery and wool. EdMar threads were used for the simple stitches; its shine adds a little bit of class to this springtime throw pillow. Embroider it in the evenings while sitting in your favorite chair and feeling the soft breeze...or work on it on the porch. Just piece together the front then pop in a hoop and set to work. Wonderful shades of soft green, rose, sky blue, sunshine, whipped cream, and washed purple bring to mind springs' new growth, warming sunlight, and cool breezes. Kit includes: Front, back, threads, vintage buttons, wool, and pattern. Kit fabrics will be identical to project shown..
buttons may vary since we are using vintage buttons from our button box...however, each kit will contain 7 white buttons and 1 pink as shown. wool may vary since we are using hand dyed wool...however, each kit will contain 3 squares of a dusty pink and 5 squares of a rosey pink. Your kit WILL NOT include: filling.